As the graphics cards in our PCs get ever more powerful, having a 4K (3840 × 2160 pixels) resolution monitor is increasingly viable for many people, and the BenQ PD3200U is an excellent example of a stylish and desirable UHD screen that can handle both business and pleasure. At such a high resolution, you really need a large screen to avoid having to squint at tiny text and minuscule icons, and with a 32-inch diagonal screen size, the BenQ PD3200U certainly provides that while avoiding being obnoxiously large – remember, this is a monitor for your desk, not a TV for your living room. A 4K monitor of this size is never going to be a budget proposition; however at £800 (around $1,000, AU$1,300), the BenQ PD3200U is actually pretty reasonably priced. It means that having a large 4K monitor isn't going to necessarily break the bank. However, there are 4K monitors out there that are cheaper. The Acer XB281HK, for example, is a 28-inch UHD monitor with G-Sync and a 1ms response rate, and can be had for £600 (around $800, AU$1,000). The Philips 328P6VJEB is another 4K monitor that's the same size as the BenQ PD3200U, but can be had for around £530 ($700, AU$900). It doesn't feature some of the BenQ PD3200U's professional-orientated features (about which we'll go into more detail later on), but if those don't appeal it's a good alternative for a more affordable price. Design-wise the BenQ PD3200U looks simple yet elegant. It’s clear this is a monitor made with work and productivity in mind, and there are none of the garish design flourishes you'll find on some gaming displays. BenQ describes it as a ‘simple, functional design for increased efficiency’, which we’d broadly agree with. That statement lacks the hyperbole many companies use to describe their high-end products, but that doesn’t mean you shouldn’t be excited about the BenQ PD3200U. At 32 inches this is a large monitor, but thanks to the thin bezels that surround it, its actual footprint isn’t that big, so it doesn’t feel like it's taking up an inordinate amount of space on your desk. The adjustable stand can be put together and attached to the screen without the need for any tools, which makes set-up nice and easy, yet it still feels sturdy. A carry handle at the top of the neck makes the BenQ PD3200U easily portable as well (although its size means you won’t be wanting to lug it over long distances). The monitor also handily comes with a KVM (Keyboard Video Mouse) switch, which lets you plug in a second PC and switch between the two while using a single monitor, keyboard and mouse. It’s a great productivity tool to have, and it means that if you use multiple machines you can potentially clear up your desk by using the BenQ PD3200U and getting rid of any secondary monitors, keyboards or mice. On the right-hand side of the monitor are two HDMI 2.0 ports, a DisplayPort 1.2, mini DisplayPort, SD card slot, two USB 3.0 ports and a 3.5mm audio port. With HDMI 2.0 you can now use HDMI to display 4K visual at 60Hz, which means you can also plug a PS4 Pro or Xbox One X into the monitor and use it as a display for those. Going back to the neck, it’s fully adjustable, allowing you to tilt and swivel the screen as well as adjust the height. The screen can also be rotated 90 degrees into portrait mode, which again gives you more flexibility. The thin neck is set quite far back into the base, which means the screen itself is also pushed back, giving you more space if you have a cramped desk. As far as features go, the BenQ PD3200U’s main selling point is its 4K UHD resolution (3840 x 2160), which provides excellent image quality. When working, you have a large amount of desktop real estate, enabling you to have numerous windows and programs open at once. The 32-inch screen size (which amounts to a 708.4mm x 398.5mm display area), means that, despite the high resolution, text, icons and other visual elements aren’t too small, with the PPI (pixels per inch) count coming in at a comfortable (yet still great-looking) 137.68. The panel type is IPS, with a native contrast of 1000:1. This ensures viewing angles are very good, which is essential for a screen of this size, as when sitting in front of it at a desk it really does take up almost all of your peripheral vision. With BenQ is pitching this as a monitor for professionals, color accuracy at any angle is important, and the 100% sRGB color gamut adheres to industry standards. It also boasts Rec. 709, which is a standard for video production. The BenQ PD3200U is part of BenQ’s Designer Monitor range, which means it has been individually factory-calibrated before being shipped. It also comes with a range of modes for professionals, such as CAD/CAM mode, which ups the contrast for lines and shapes in technical illustrations when using CAD programs. The BenQ PD3200U also includes Low Blue Light and Flicker-free technology, which make using the monitor at night more comfortable. Animation Mode boosts the brightness of dark areas without overexposing light areas of an image, while Darkroom Mode, which enables you to work comfortably in dark environments. An included round switch connects to the monitor and allows you to quickly switch between presets and options, and this can be easily customized. Both the straightforward design and the breadth of features makes the BenQ PD3200U an excellent monitor for productivity, while a good selection of ports allow it to perform as a great entertainment screen as well. In use, the BenQ PD3200U performed very impressively. Windows 10 scales brilliantly at 4K, and even at that high resolution, menus, text and icons are easily readable, mainly because of the large screen size. 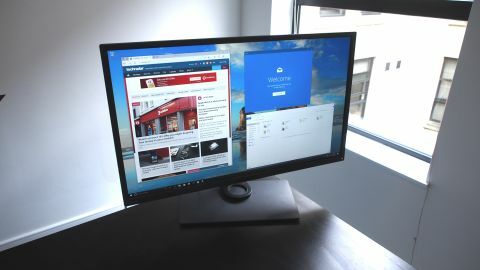 We’ve found that 4K monitors with screen sizes below 27 inches can be difficult to use, unless you up the scaling, which negates some of the advantages of using a 4K screen. We were able to work comfortably on the BenQ PD3200U with a large number of programs and windows open, including web browsers (full of tabs, naturally), which were able to show almost entire web pages without the need for scrolling, along with a word processor, image editor and more. The resolution of UHD is equivalent to four 1080p screens, and it really does feel like you have a huge amount of space when using the BenQ PD3200U – without the fuss and extra space you'd require if using four separate monitors. Images and video files also looked excellent on the BenQ PD3200U. This is where the factory calibration really comes into its own, as we’ve often had monitors in for review on which we’ve had to fiddle around with some of the settings to get the optimum image quality. That wasn't necessary with the BenQ PD3200U, as it looked fantastic straight out of the box. The various modes bring some enhancements, although ones such as CAD/CAM mode will only be of use to a small market of professionals. If you’re buying this as a business monitor for your work you'll be pretty impressed with its performance, especially considering its price. But what about performance for non-professional applications? We hooked it up to a gaming rig with a mighty Nvidia GTX 1080 Ti graphics card, which does a pretty decent job of pushing games at 4K resolution, and they really did look superb. Although the 60Hz refresh rate won’t impress any gamers used to higher refresh rates and G-Sync or FreeSync technology, if you’re playing modern games at 4K, 60Hz is pretty much all you need. However, the 4ms response time will be too much for people who need almost instant reflexes in online games; a gaming monitor with a 1ms response time will be required for those situations. So, if you’re looking for an excellent high-resolution monitor with accurate color reproduction, which can also do a good job of displaying films and games in your downtime, the BenQ PD3200U is a great choice. Monitors like the BenQ PD3200U give us hope for a 4K future. It performs brilliantly, and the large screen size really gives you an insight into how a large 4K monitor can improve your productivity. Going back to a 1440p screen after experiencing 4K with the BenQ PD3200U has been painful, with our still-pretty-high-resolution monitor feeling cramped and claustrophobic by comparison. The BenQ PD3200U also does a decent job of showing off media and games in 4K, so don’t dismiss it because of its professional-focused design and features.